Sheila Ryan wrote about the connections between Democratic Party leaders and the Institute of International Labor Research, an organization that designed and set up “left” parties in seventeen Latin American countries, supporting them with funds from the CIA. The leaders of these parties then helped the United States to orchestrate the installation of politicians loyal to the United States, like Bosch in the Dominican Republic, without showing their hand too obviously. 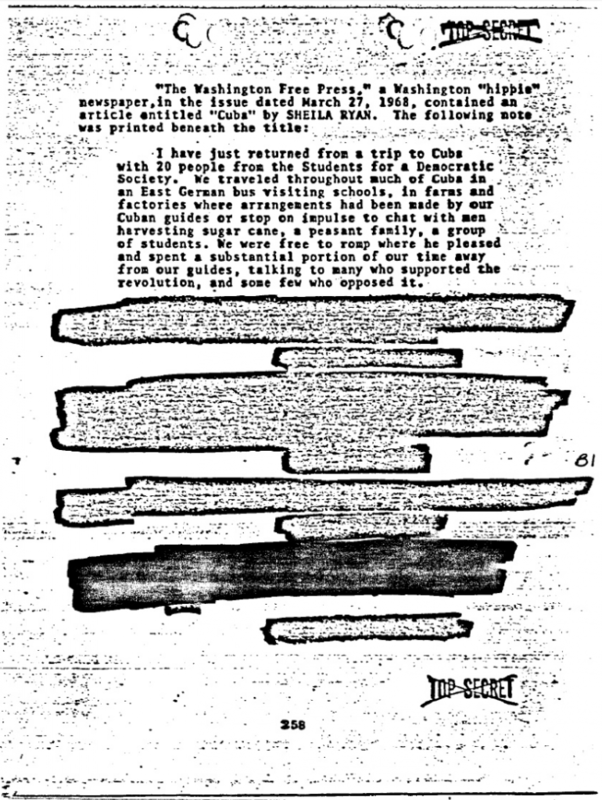 WFP writers also researched connections between local political people, including a few in the peace movement, and CIA-funded foundations and institutes. Through these articles, and others published in Ramparts magazine during the same period, I learned to search for the funding behind any foundation, organization, or institute and to stay suspicious of the hidden hand of the CIA, which in the name of democracy often sought to undermine local grass-roots forces. … Peter Henig’s friend from Earlham, Marilyn McNabb… like Peter and Sheila, was drawn to the task of teasing apart the connections between the various circles of power in the country, and in so doing, showed how these circles knowingly served each other. — From Flying Close to the Sun: My Life and Times As a Weatherman, By Cathy Wilkerson, Seven Stories Press 2007, p 136-137. This entry was posted in Citations, Left Press on July 1, 1967 by Matthew. By 1968 important new elements were joining the ranks of the disillusioned. Business, much of it having assumed a partial and tentative membership in the liberal coalition, began to fear the inflation caused by the war. An antiwar group composed of Wall Street business executives, including Marriner Eccles, chair of the Federal Reserve Board under Presidents Roosevelt and Truman, took out an ad in the New York Times opposing the war on grounds it termed practical. One antiwar activist, Sheila Ryan, attacked Eccles for owning mining operations that might conceivably benefit from the war’s end: evidently since he was not openly on the side of Hanoi and the National Liberation Front he had to be on Johnson’s. Ms. Ryan and some other members of the New Left had come to believe that only mass violence by urban guerrillas would end the evil sway of United States imperialism. Appearing to dislike Eccles and such liberals as Arthur Schlesinger more ardently than they did Johnson, they took as their hero the Argentine-Cuban revolutionary Ernesto “Ché” Guevara. — In “Making Peace With the 60s“, by David Burner, Princeton University Press, 1996, page 208. This entry was posted in Citations, Left Press on October 1, 1968 by Matthew. 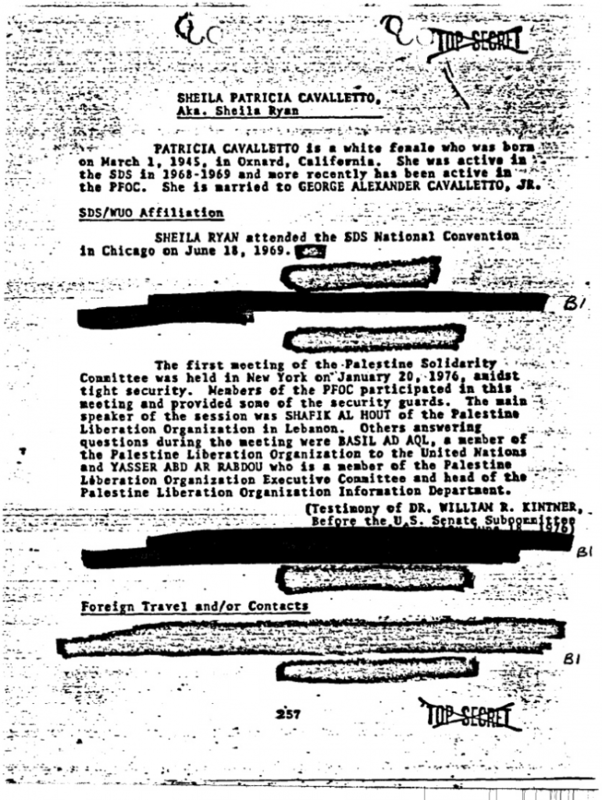 In 1976, the FBI assembled a report on the Weather Underground that included Sheila and George on the same list as Bill Ayers and Benardine Dohrn. This is inaccurate. Sheila and George were never members of the Weathermen or the Weather Underground. 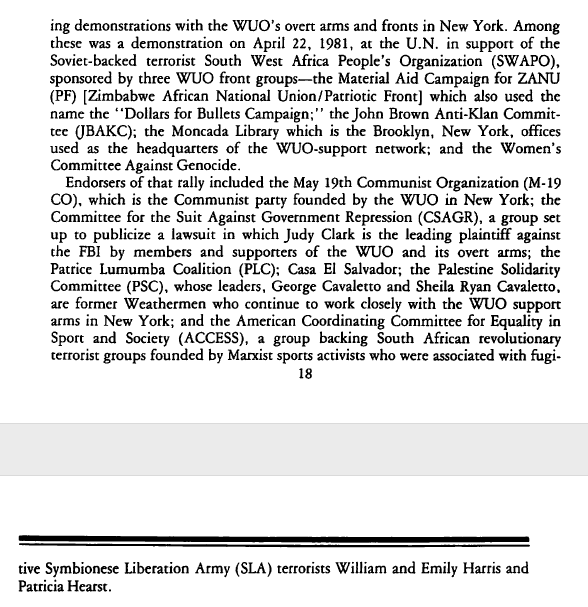 However, because they had known and worked with a number of the SDSers who chose to go underground as the Weather Underground, and because of their ongoing activism, they were included in FBI write-ups of possible Weather Underground associates. Sheila disagreed with the “small vanguardist strategy” adopted by the Weathermen, which she saw as undermining the efforts to build mass movements in the United States that could bring about real political change. Eventually released under the Freedom of Information Act, the document is available through the FBI’s web site. This entry was posted in Citations, Left Press on August 20, 1976 by Matthew. 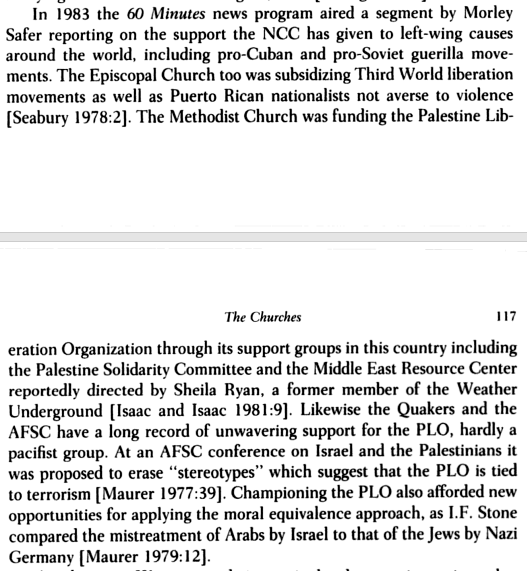 In 1983 the 60 minutes news program aired a segment by Morley Safer reporting on the support the NCC [National Council of Churches] has given to left-wing causes around the world… The Methodist Church was funding the Palestine Liberation Organization through its support groups in this country including the Palestine Solidarity Committee and the Middle East Resource Center reportedly directed by Sheila Ryan, a former member of the Weather Underground. This entry was posted in Citations, Middle East and tagged crazed critics on December 31, 1983 by Matthew.